At Dental Implants Center in New York we offer a long-term solution for replacing multiple missing teeth with mini dental implants, multiple teeth implants using one day dental implants procedure. NYC dentist Dr. Navid Rahmani is a top dental implant specialist in New York and one of few implant dentists in NY region to offer newest and most advanced dental implant options and latest procedures. 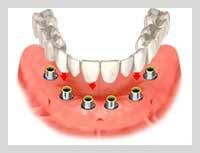 Two or more dental implants can be used to support a bridge. This is probably the least perfect solution for replacing multiple teeth although it is very cost-effective. Replacement teeth are attached to an acrylic denture base and the partial denture is held in place by clips that will fit around existing teeth or by special attachments that will clip onto dental crowns. It is possible to make a dental bridge that will replace multiple missing teeth, covering a long span of the dental arch. To do this, your existing natural teeth must be strong enough to withstand the substantial forces that will be placed on them when they have to support multiple replacement teeth. 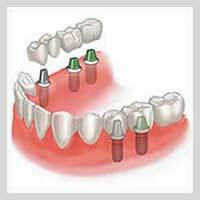 Using optimally placed dental implants in NYC dental center, we can replace multiple missing teeth with an implant supported bridge. This makes it possible for people to have a fixed restoration and is ideal when existing natural teeth may not be strong enough to support a conventional bridge or when they are missing altogether. It can take relatively few dental implants to support multiple teeth. Depending on position and bone structure we might be able to use Mini dental implants or small diameter implants or narrow body implants. Mini dental implants are still made from the same high quality titanium alloy implants but their smaller size increases the versatility of treatment. You may also hear these dental implants referred to as small diameter implants or narrow body implants. With this option the implants need to be left to heal and integrate with the jawbone so the entire process can take several months to complete. During this time you will be provided with a temporary prosthesis, for example a removable partial denture to ensure you can eat and speak properly. This is a highly advanced technique that can be used to replace multiple missing teeth in just a day using one day dental implants. With this procedure, the dental implants in NYC are inserted into your jawbone but can be immediately restored with a provisional crown or bridge. This will have been pre-made before the implant surgery takes place. We find this technique very popular as it allows our patients to have teeth that will feel and look very natural. Once dental implants in a day surgery is complete, you will be able to go home with your temporary teeth attached to your implants. You will still need to return to see us few months later once the implants have fully integrated with your jawbone so we can make your final restoration. It can be a great solution for anyone who is dreading being without teeth or who currently has a partial denture that they would love to get rid of. Teeth in a day can also be useful for patients who have lost teeth due to periodontal disease or tooth decay, or due to some other trauma. Do you have any questions about solutions for replacing a multiple teeth in NYC? Would you like to schedule an appointment with a best dental implants in NYC specialist, Dr. Rahmani of Dental Implants Center NYC, please contact our office for consultation.